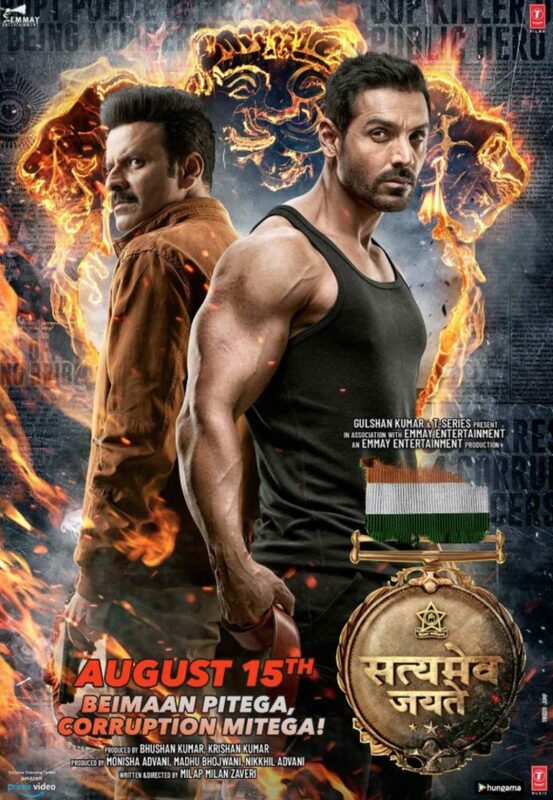 The first poster from the movie Satyamev Jayate is now out by John Abraham. Milap Zaveri directs the film. The first look of the movie was already out back in April. In first look of this movie, you see Manoj was pointing the pistol at John Abraham. Manoj is playing the negative role in the film. Opposite to John Abraham Aisha Sharma is featuring as the female lead role. Satyamev Jayate is the debut film for the lead actress Aisha Sharma. In an interview with the Mumbai Mirror, she said as an outsider in this industry your choices is essential. Because you don’t get another chance. So She was waiting for the right project from few months. Sharing screen with John is the great pleasure for her, and it’s the perfect occasion to debut in Bollywood. In recent news, filmmakers said they want to title the film Satyamev Jayate. But the problem is Title Satyamev Jayate is already under the rights of Aamir Khan. Satyameva Jayate is the title of Aamir Khan hosted talk show. The whole team is very keen on obtaining the title Satyameva Jayate from Aamir Khan. The film is a suspense thriller. Producers want to make this movie out the occasion of independence day as its the best time to out movies like this said by director and producer. So the film is expected to be out on 15, and it will clash with the Akshay Kumar movie Gold. Gold is the movie directed by Reema Kagti. The film is based on the story of the hockey team who won their first Olympic medal on 12 August 1948. Its an inspirational story of a team. This movie is excellent for all the audience who is having the interest in sports. Akshay Kumar is the lead star of the film which is starring with Mouni Roy. As it’s the debut of Mouni Roy in Bollywood. Before that, she was famous Tv actress.